When I logged in at the CPH [Copenhagen, Denmark] airport for their free Wi-Fi, many of my Safari icons were changed to the airport logo. How do I change them back? This is the heartbreak of portal pages, something you’d think would be solved after about 15 years of publicly available Wi-Fi networks that use interception technology to require you to accept terms of service, watch an ad, log in, or make a payment to use the network. So if Safari chooses this moment to refresh and check that any or all of its bookmarked site icons (called favicons) are up to date, all of these requests are redirected, and the tiny icons are replaced with whatever the portal favicon is. Apple used to make it easier to reset favicons in desktop Safari, but recent versions no longer have a specific item designed for this purpose. You’ve got two options. Delete the WebpageIcons.db file and empty the Trash. Select Safari > Clear History. Select All History from Clear. Clearing all history in desktop Safari deletes stored favicon. Swipe down to Clear History and Website Data and tap that button. 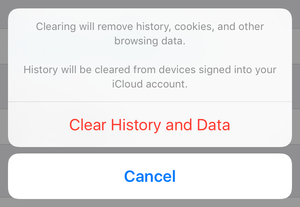 Confirm by tapping Clear History and Data. In iOS, you can use the nuclear option, which dumps website icons, too. You can also wait: these icons are regularly, but not continuously refreshed, which means your problematic favicons will resume their normal status eventually.